I like to buy characters I see and fall in love with. I have found that if I don't then they won't be around later to purchase. Not that I always have the funds. Because of this buying plan, I do have a number of characters that are in my cheese dome. As I work on a project often they inquire if there is a place for them yet. 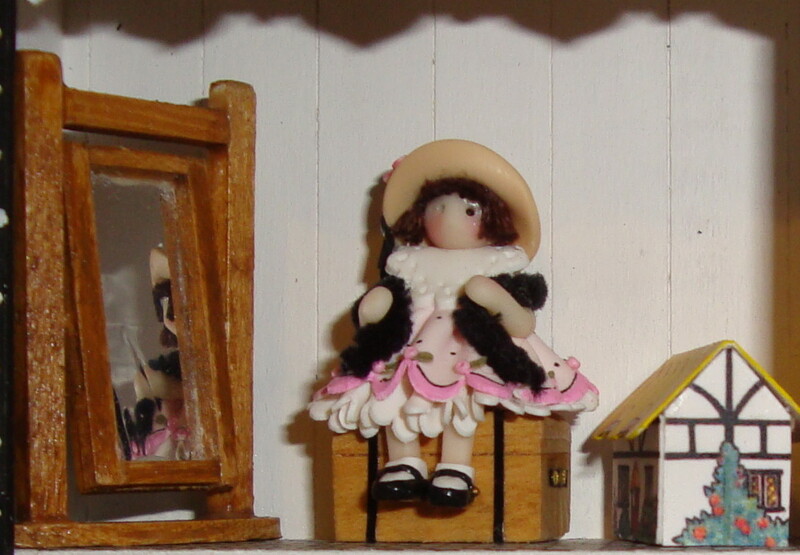 Inspired by ME's rendition with a girl sitting I debated about removing an already placed doll. But one day this bunny got my attention. After hearing what project I was working on, she informed me that she could get the job done. 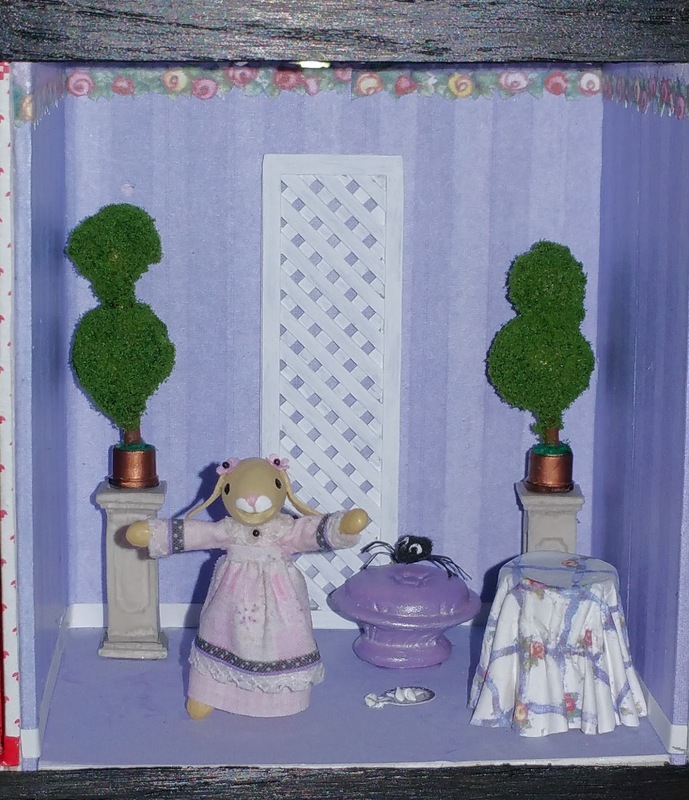 Her audition went great, so she is now Miss Muffet. The table is a dowel cut to size that I added paper. The paper was actually leftover wallpaper from another project. To drape it, I added glue and paper towel. While the glue was wet, I shaped it. The tuffet was a resin chair that I cut off the back and base. The middle section pictured became the tuffet. The chair was over-sized and so I hadn't found a good spot for it yet. I repainted it to match the room. Spider is a trimmed pom pom painted black. Legs were cut from the edge of black paper. Eyes punched from white paper and painted. The two plant sculptures were swaps. Purchased the stands. The dish of curds and whey was a punched bowl plus some bits of dried paint. The Queen was a swap from Mary E. Johnson. Fabulous! The ice box and dry sink are painted BPF. Wallpaper and flooring is by Joe Hermes and was some I had in my stash. 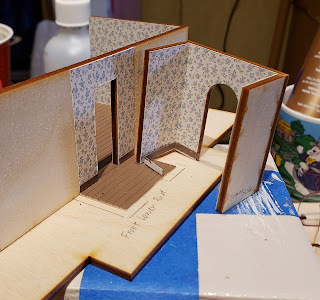 The baseboard is painted quilling paper, which is my new favorite thing - I bought a bunch of white this year to have in my stash. The windows are Grandtline. I painted them, then added plastic and a printie background. 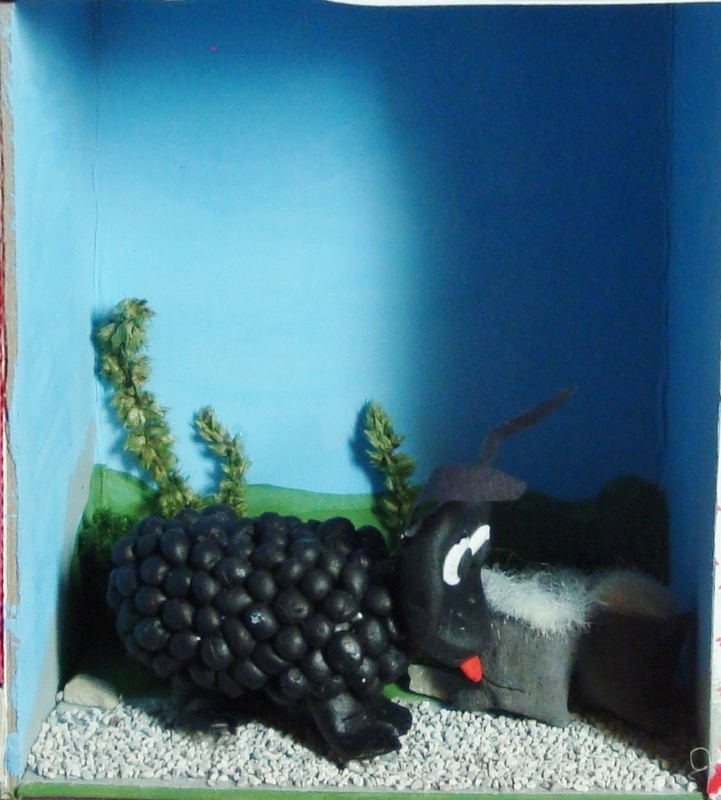 The sheep and the bags of wool are a swap from Alicia Ramirez. The landscaping is bits of foam. The road is ballast from a train store. The lamb and hook were a swap from Kristie Dubord. The brick is red plastic. I added white paint to fill the grout. Then I used a paper towel dipped in isopropyl alcohol to wipe away on the brick surface. The base stone is also plastic and I left it unpainted. Both plastic siding was purchased online. The taller greenery is lycopodium. Other landscaping bits are foam.